I read this article and found it very interesting, thought it might be something for you. 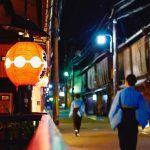 The article is called 12 Month Journey in Kyoto (January – December) and is located at http://trip-n-travel.com/listicle/10260/. The beautiful and mysterious former capital of Japan abounds with history and culture to mesmerize any visitor no matter what time of year they choose to come. 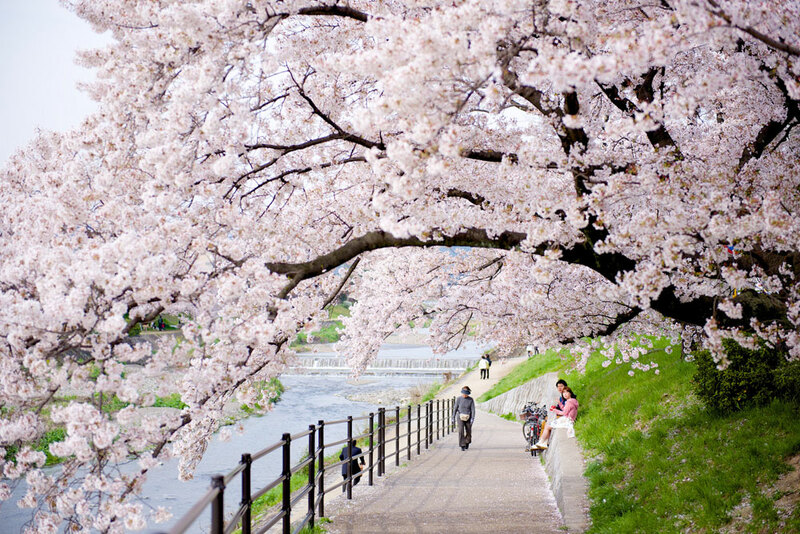 While Kyoto, and Japan in general, is most popular in the spring season when cherry blossoms are in full bloom, you can be rest assured that this city has a lot to offer in every month of the year, with dramatic changes to the seasons that are sure to awe. So let’s take a look at Kyoto by month so you can see what it has to offer no matter the month you’d like to visit. Celebrating New Year’s is an age-old tradition in Japan. And Kyoto is a great place to be to welcome in the new year. On New Year’s Day, you can head to one of Kyoto’s many temples and shrines to offer prayers and wish for luck in the coming year. 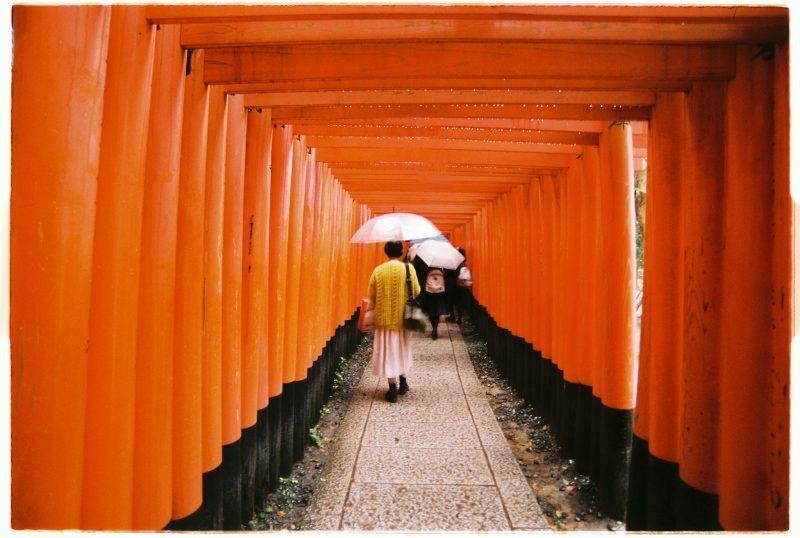 Fushimi Inari Taisha is one of the most popular shrines in Kyoto for its myriad orange tori (shrine gates). Heian-jingu Shrine in Northern Higashiyama is popular for its large courtyard which can hold many visitors at once. 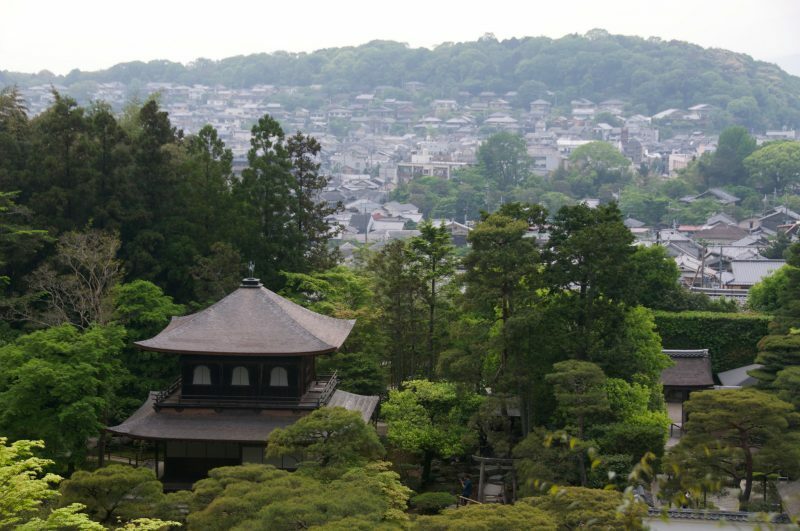 Or you can head to Yasaka-jinja Shrine to get an overlooking view of all of Kyoto. There’s no shortage of options for participating in the festivities. Also remember that Kyoto can get very cold and it can even snow. With an average temperature in this month of 5°C (40°F), you’ll need to pack some heavy overcoats to get through the blistering winds. 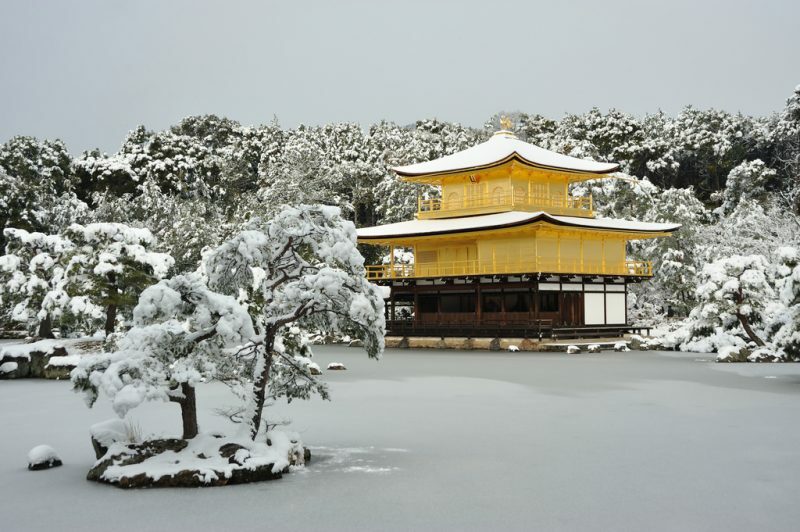 If you are so lucky enough to be in Kyoto during snowfall, head straight for one of their famous temples or shrines immediately. There’s nothing like walking through one of these serene locations covered in a fresh layer of snow. Keep in mind that most businesses are closed through January 2nd – sometimes the 3rd. During these days, you may have to make like a squirrel and accumulate your own supply to tide you over for a few days. Convenience stores will usually remain open. Or, you can buy food at the basement food floors of the Takashimaya and Daimaru Department stores after January 1st. While you’re at it, you can also try out some traditional Japanese New Years foods to really get into the season’s spirits. 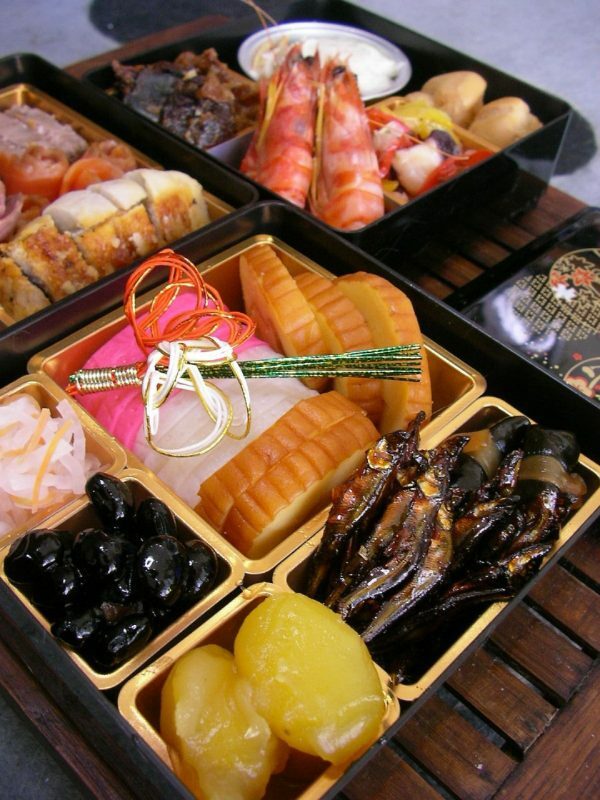 Pick up a box of osechi – an assorted bento box of cold foods – or a bowl of ozoni, a Japanese soup containing mochi rice cakes. One of the funnest celebrations you may come across in the calendar year is Japan’s annual tradition of celebrating Setsubun. This holiday is similar to ground hog’s day in the US and is usually marked on February 3rd. Revelers throw beans at a mythological oni – or Japanese devil – to mark the coming of spring by scaring away demons and evils from the previous year. Head to Yoshida shrine to see the largest Setsubun celebration in the city. If you stay until 10pm, you can watch a massive bonfire put together for anyone left in the crowd. People will often bring old clothes and items they want to throw away as a symbolic cleansing for the new season. Then get ready for one of Japan’s favorite imported holidays, Valentine’s Day, on February 14th. But remember that the rules work differently here. Rather than men buying the chocolates and flowers, women are tasked with getting chocolates for their men. Or just their friends and coworkers. Shops all over Kyoto will decorate their store fronts with all kinds of Valentines related paraphenalia. And you’ll find no end to all the creatively designed sweet treats you can buy. If you’re in Kyoto on February 25th, don’t miss Kyoto’s annual tea ceremony hosted by geisha. Though private geisha tea ceremonies can run up the bill beyond what most visitors are willing to pay, you’ll find this one much more affordable at 1,500 yen ($14 USD). The Baika-sai Matsuri is dedicated to the blooming of plum blossoms and is held in Kitano Tenmangu Shrine. March is a great time in Kyoto as the city sheds off its winter coat and the first hints of spring start to arrive. By the time the month is over, cherry blossoms may start blooming. Catching cherry blossom blooms is a tricky affair every year as local weather patterns will dictate when they actually begin. In Kyoto, this ranges from roughly March 20 through April 14. But once they start, they’ll only last about a week before the petals fall away. So give yourself a bit of room when planning to see cherry blossoms. Still, this is undeniably a beautiful season to see the city with very many viewing sights all around town. Maruyama Park is Kyoto’s most popular spot for catching cherry blossoms. 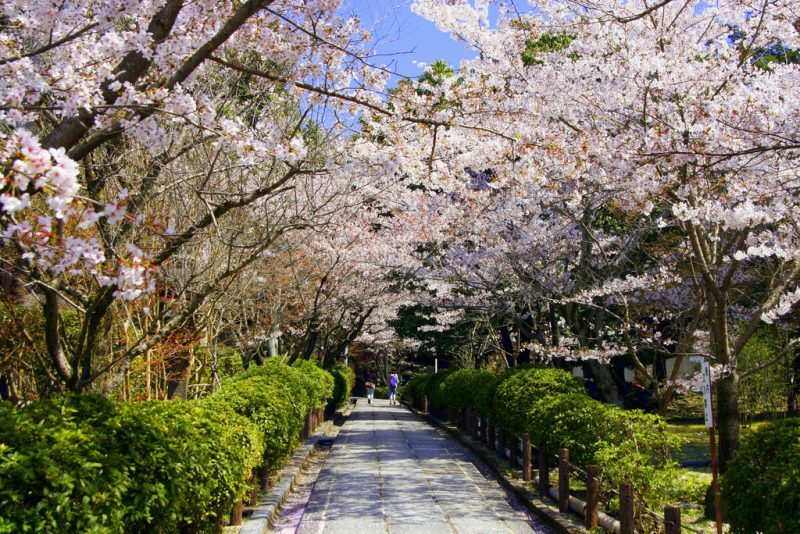 The Path of Philosophy (Tetsugaku-no-Michi) is another popular area with an entire path lined with cherry blossom trees. At night, the place is illuminated and the light toned trees take on an otherworldly glow. Shimbashi (Shirakawa) is a wonderful street in Gion that looks even more beautiful during cherry blossom season. And did you think it was unfair that girls did all the chocolate buying on Valentine’s Day? Well, now it’s time for men to reciprocate. On White Day, March 14th, men will buy chocolates or cookies for their female friends or their secret crush. Expect to see lots of tempting sweet treats on display in shops all around town once again during this season. Warm weather begins to thaw out this ancient city and sakura season continues as hanami parties reach their peak. As as you watch the beautiful metamorphosis take place in the environment, you can also partake in the many events going on in town to compliment the changing of the season. There are Geisha dances being held in halls across Kyoto all month long. The biggest of them all is Miyako Odori held at Gionkobu Kaburenjo. Put on by the geisha of the Gion Kobu geisha district, the show is a spectacle of sound, light, and ofcourse, a massive showing of geisha. With shows held daily in the month of April, there’s no reason to miss it. The show was created by the Geiko of Kyoto. in the 1870’s, a few years after the capital of Japan moved from Kyoto to Tokyo. 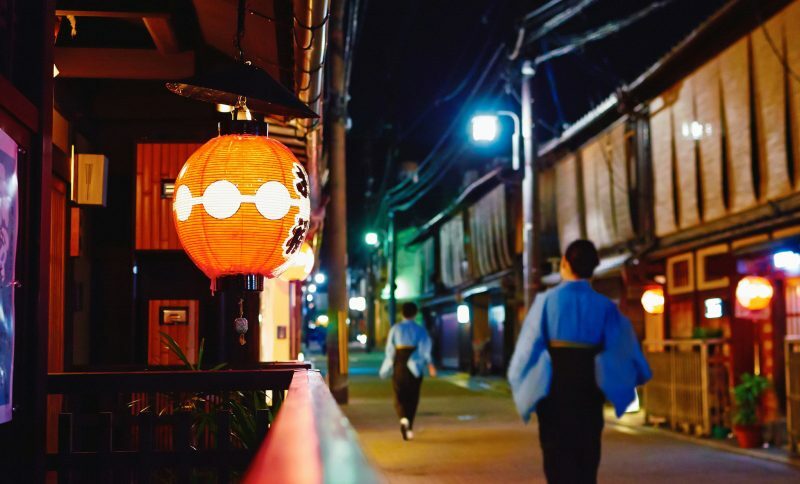 The dance, literally translated as The Dance of the Capital, was intended to raise the spirits of local Kyoto residents after the move of the capital away from their hometown. At the end of the month, expect to see an upswell in tourism as Golden Week begins. This national holiday starts on April 29th and goes until the first week of May and it may be the only time in the year that Japanese locals will travel both domestically and abroad. So it gets a little busy. If you’re visiting Kyoto at this time, be sure to book accommodations and transportation in advance. It’s getting a little warmer now but it’s still pleasant. And best of all, the crowds who came to Kyoto to see the cherry blossoms have since dispersed so it’s easier to get around and see all the amazing sights. Plus, there are special sights this month that elude other visitors. In the first week of May, head to Ginkaku-ji Temple to see the special opening of Togu-do and Dojin-sai, two places inside the temple that are considered national treasures. Togu-do is a hall with Buddhist images and mortuary tablets. Inside the hall is a tea room and garden called Dojin-sai. Beginning May 3rd, check out Aoi Matsuri at Shimogamo Shrine. The matsuri can take the prize for the longest continuously running festival in Japan, having started in the 6th century. It began as a way to please the Kamo gods, associated with thunder and weather, after a series of storms caused famine. Festivities begin with a show of yabusame (mounted Japanese archery). Don’t miss May 12th, where you’ll see a procession of people in Heian period custom. 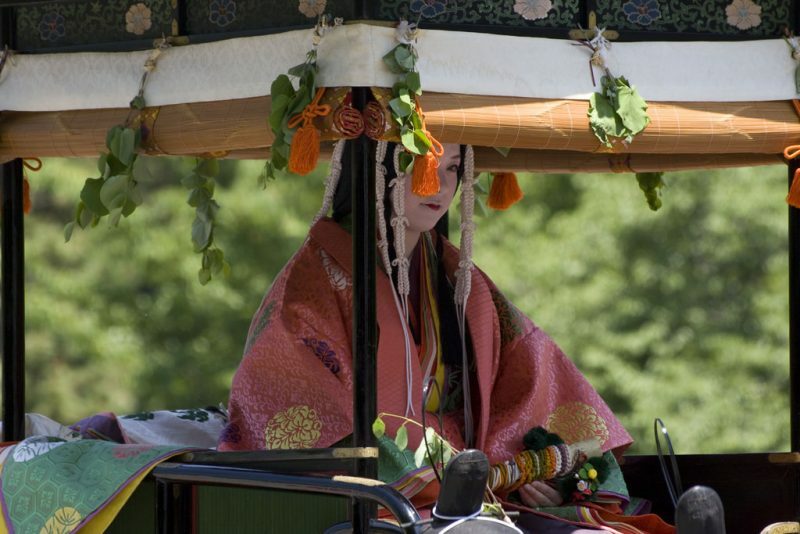 The festival culminates on May 15th with a grand Heian period reenactment and Imperial procession. Be prepared for the start of rainy season spanning the middle of June through mid-July. For those unfamiliar with rainy seasons in Japan, this is not going to be a light drizzle. Pack an umbrella this month. Or hop into any convenience store to get fairly durable plastic umbrellas on the cheap. And don’t worry, while downpours can get pretty heavy, they never last too long at a time. And they definitely don’t keep people from going out and having fun. Japanese Noh performances are mysterious and dramatic plays conducted with famous Noh masks worn the performers’ faces. 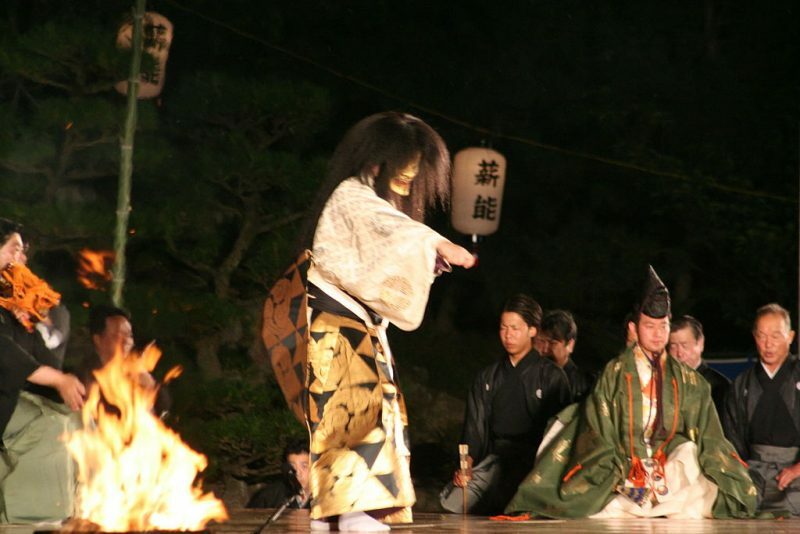 On June 1st and 2nd, check out this poetic performance by bonfire at the Takigi Noh Night-time Performance at Heian Shrine. Three major Nohgaku schools (Kanze, Kongo, Okura) will showcase this elegant performance on a special outdoor stage. Buy tickets in advance for this rare treat to secure your seat and remember that photography is not allowed. It might be getting a bit uncomfortably hot this month but get ready because you’re about to see the biggest festival in all of Japan take place this month, Gion Matsuri. The behemoth of a festival spans all the way from July 1st to 29th. But if you can’t make it out every night, save the dates for July 17th and 24th (the 17th being more important) when yamaboko (huge wooden festival floats) are paraded through downtown Kyoto. But take note that the highlight for most visitors may be in the “Yoi-yama” events leading up the 17th and 24th themselves. 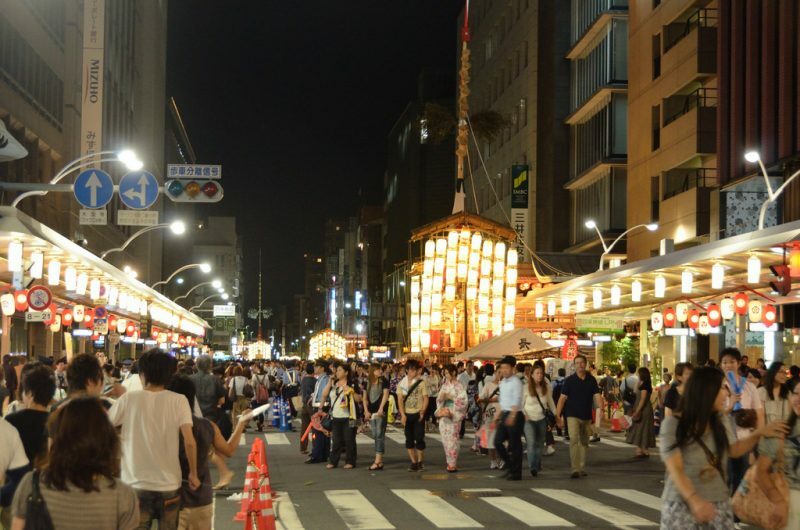 In the three days prior to both these events, you’ll find Shijo-dori and neighboring streets will be closed off to traffic, allowing pedestrians to take over. Men and women dressed in beautiful yukatas will roam the streets, perusing the various food stalls and vendors who have set up shop. Why not get yourself one of these beautiful traditional garments and head out on the town yourself? The rainy season is over but the sticky heat is still around. Outdoor events are ideal this month and there’s plenty of that around in Kyoto. 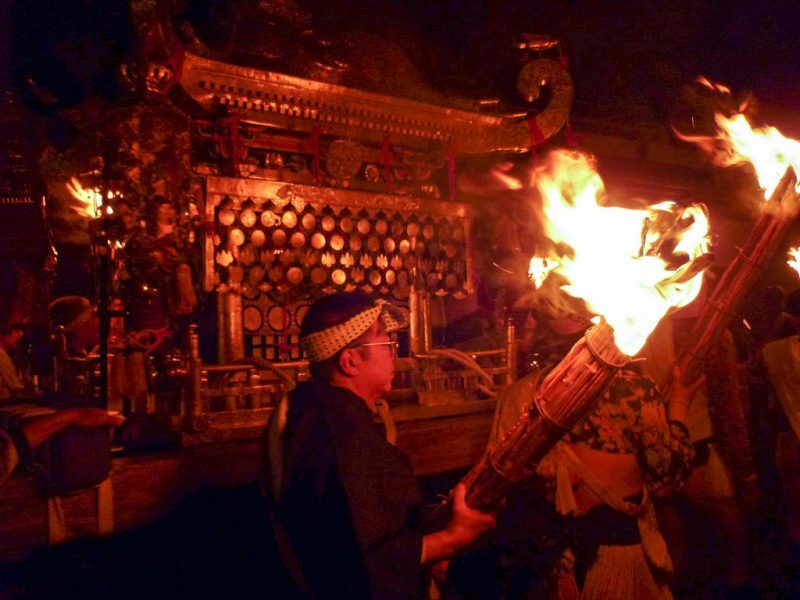 The most famous this month is the Daimonji Fire Festival. 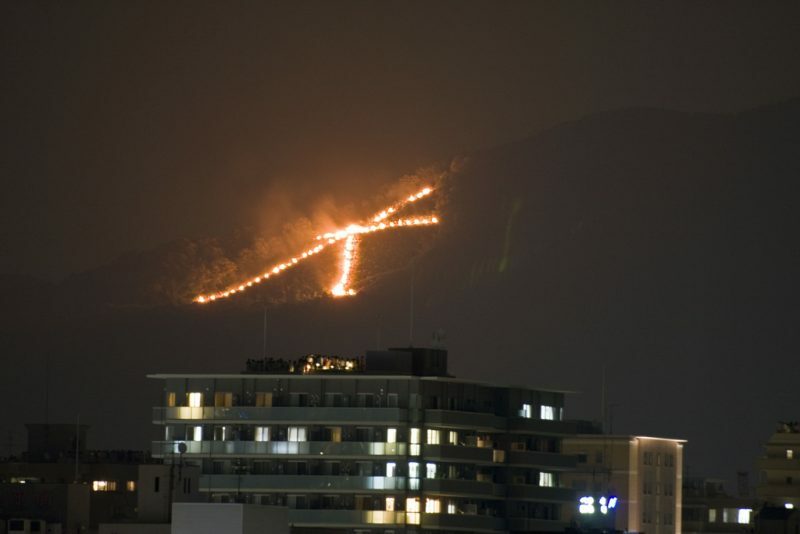 Massive Chinese characters written on the sides of hills around town are set ablaze in a stunning show. The grandest of the bunch is the mountain of Daimonji, which towers over Ginkaku-ji Temple and the rest of northern Higashiyama. The lighting starts at 8pm and each subsequent hill is lit in counter-clockwise order in 15 minute intervals. 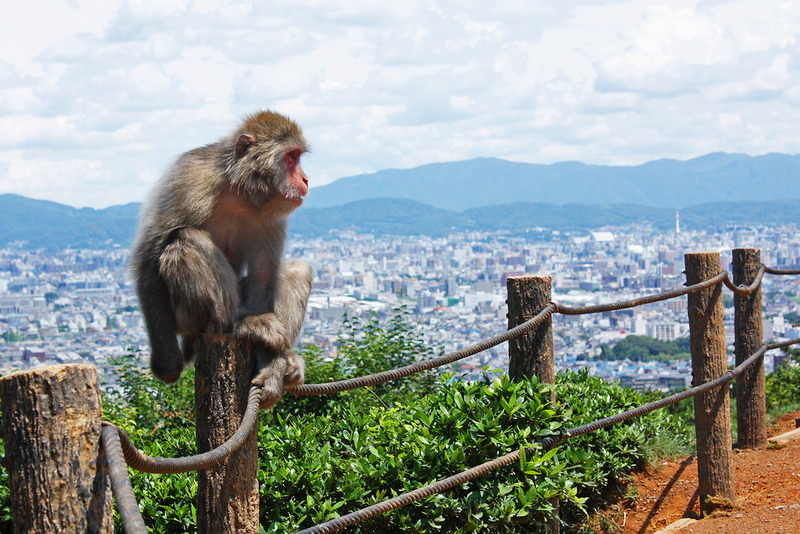 To get a good viewing spot, head to the East side of Yoshida-yama, parts of the Gosho, parts of the Kamo-gawa Riverbank, or the rooftop of a very expensive hotel. 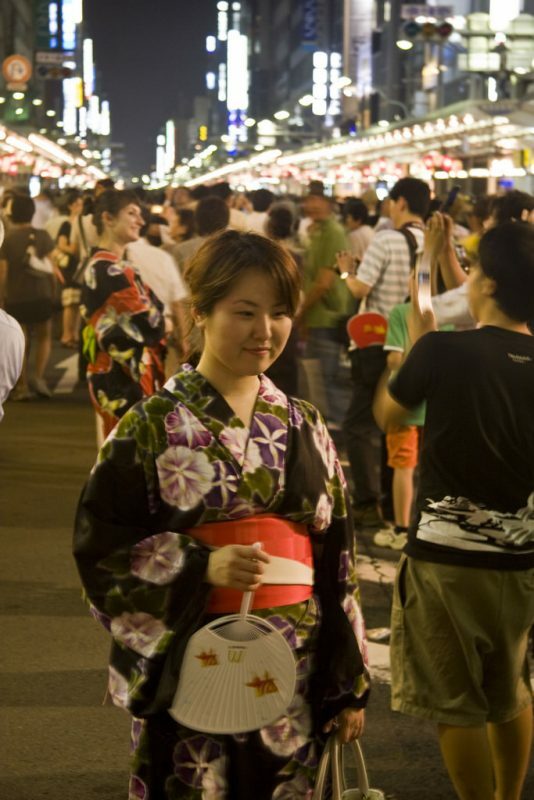 August 16th is the last day of Obon – one of Japan’s largest holidays dedicated to honoring one’s ancestors. And in the evening of this day, people will gather at Hirosawa-no-Ike Pond to light lanterns and float them on the waters in a final ceremony full of symbolic meaning. The Toro Nagashi as it’s called is a poetic gesture and an amazing sight to behold. It’s not to be missed so be sure to get there at 7pm when the lighting starts. Weather is finally beginning to cool down in this month and you’ll start to feel the pleasant breeze on your face as you walk around town in this transitional month. It’s also a low season for tourism, which can be a boon for anyone already here. 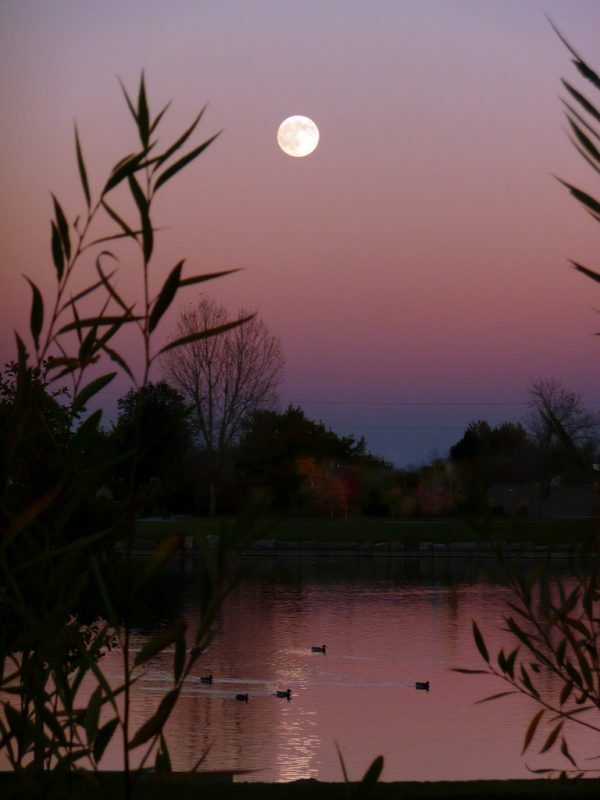 In this month signaling the end of a season, you’ll find a number of events revolving around the harvest moon. Moon viewing parties take place every year around the end of September or October. 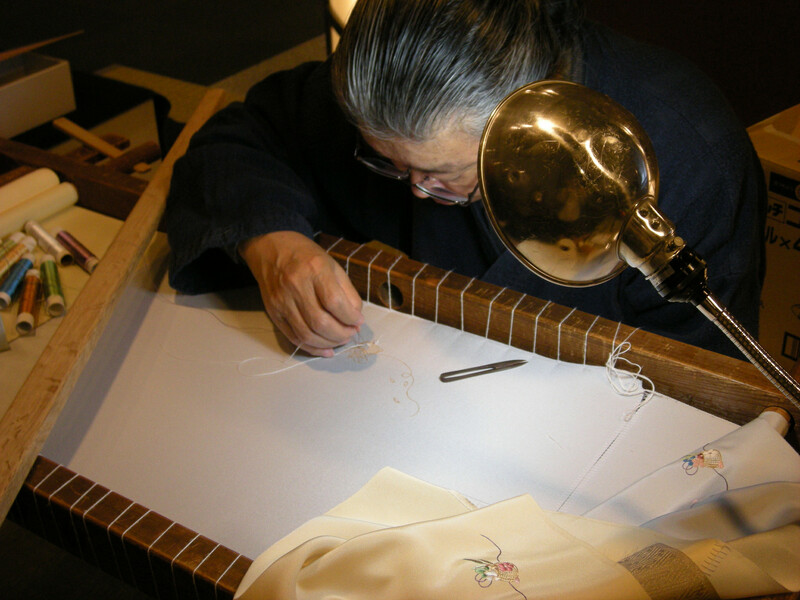 The custom was introduced to Japan from China during the Nara and Heian periods. It’s said the moon is brightest and most beautiful on this night. In Kyoto, you can view the full moon reflected in Osawa-no-ike Pond at the Daikaku-ji Temple. Shimogamo-jinja Shrine is another popular location in which to view the moon. 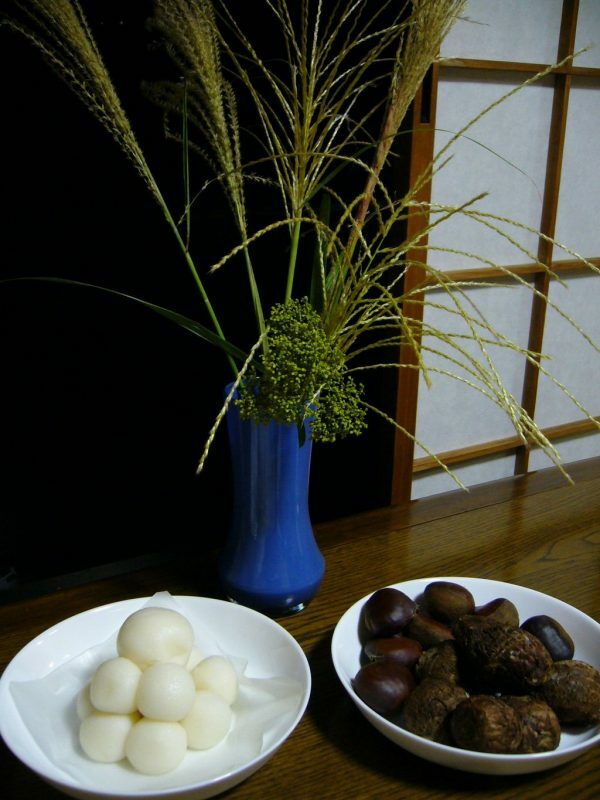 And remember that while you’re there, pick up a traditional treat called the tsukimi dango dumpling. These white rice dumplings come in two forms, one plain white version is rolled into balls and stacked on top of each other. The Tokyo version is more oval and contains sweet bean paste. Both versions will go on sales in the days preceeding the moon viewing parties and are supposed to complement the experience. 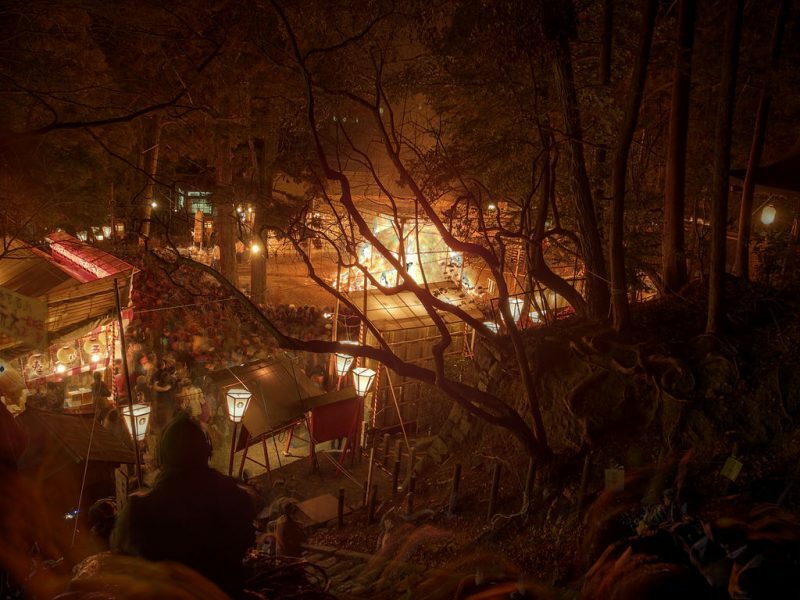 One of the wildest, and possibly physically dangerous, festivals in Japan is held in a small village near Kyoto this month. The Kurama Fire Festival in the village of Kurama the Kurama Fire Festival in the village of Kurama acts as a rite of passage for the youth of the area. The ceremony starts off with little children holding small sized fires (with parent supervision ofcourse). Then teenagers upgrade to carrying huge torches. Followed by adult men who carry the most massive torches of all. And in case that wasn’t enough, the festival culminates in the carrying of a mikoshi up a giant hill to Yuki-jinja Shrine. The journey is perilous and people have been injured in the past. It’s quite a spectacle to see, just stay safe. 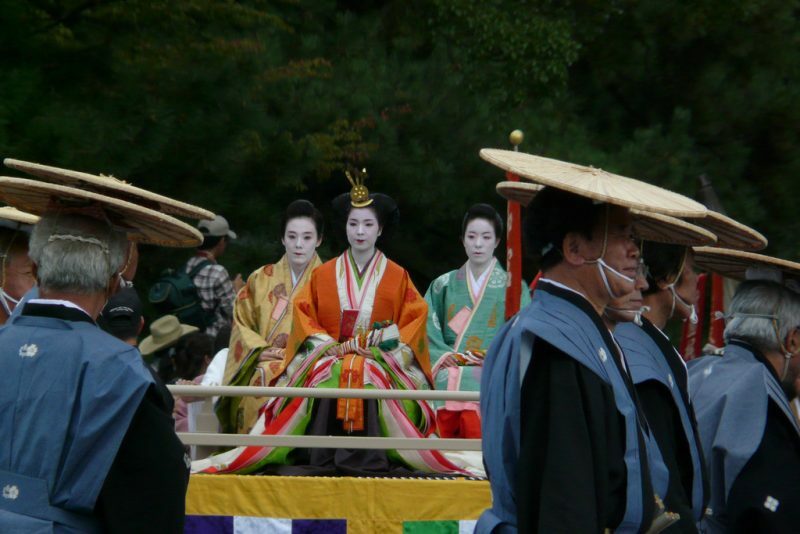 To get in some historic culture, check out the Jidai Matsuri on October 22nd. It features a parade and historical reenactment of a Heian Period Imperial Procession in Kyoto. As you may have guessed, it began in 1895 to celebrate Kyoto’s glorious past after it lost its status as the capital of Japan to Tokyo. The festival commemorates Kyoto’s founding as a capital in 794. You can watch the parade from the Imperial Palace in the morning or at Heian Shrine at around 14:30 in the afternoon. Although Halloween is continuing to become an incredibly popular holiday in Japan, it’s unfortunately a little underrepresented in Kyoto. If you really want to see some Halloween festivities, check out the Kitayama Halloween Parade. But if you’re looking for more of a party experience, it’s probably better to take a short trip to Osaka or Tokyo instead. 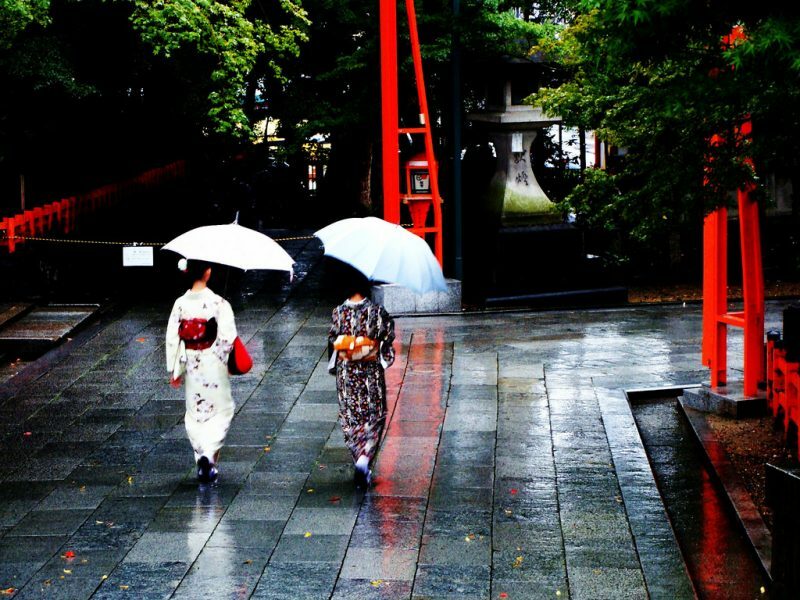 November may be one of the most spectacular months to come to Kyoto. The end of the month especially will see some vivid changing of the leaves for the fall season and pretty much every part of the city will become a picturesque photo opportunity waiting to happen. Put on some warm clothes to battle the chilly weather and get yourself to a park or shrine at night to check out one of the many night-time illuminations going on this month. Some great places you can go include Kiyomizu-dera Temple, Eikan-do Zenrin-ji Temple, and Nison-in Temple. 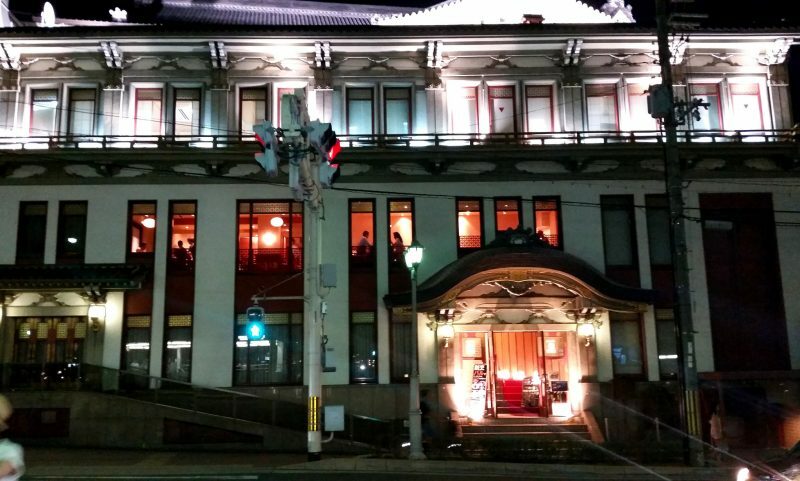 Winter Kabuki season starts on November 30 at Gion’s grand Minami-za theatre. This is a great chance to see this refined art form which plays out traditional Japanese fables and legends through an elaborate song and dance performance. Keep in mind that each individual show may not present a full storyline and instead chop it up into smaller acts. So you’ll have to go to more than one show to get the full story end-to-end. 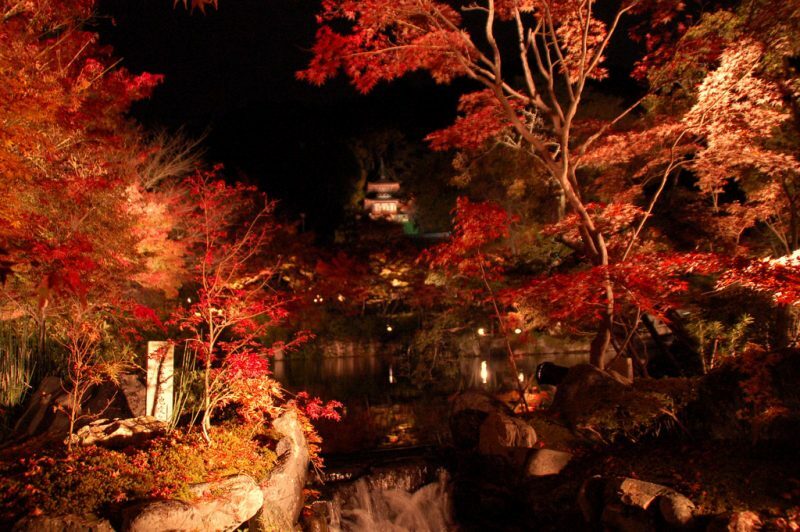 You’ll continue to see autumn leaves all around town this month and the major temples and parks will continue to host night-time illuminations that highlight the deep reds of the trees. In addition, as the month goes on, snow may start falling on occasion. 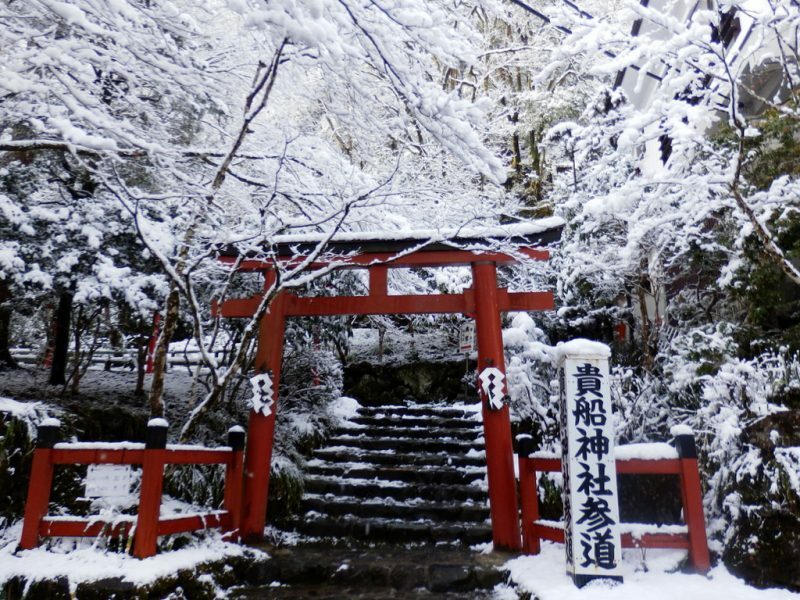 In Kyoto city, snow doesn’t stay on the ground too long when it falls but if it does, you should definitely head straight to the nearest temple or shrine to get a glimpse of the place dusted in white. 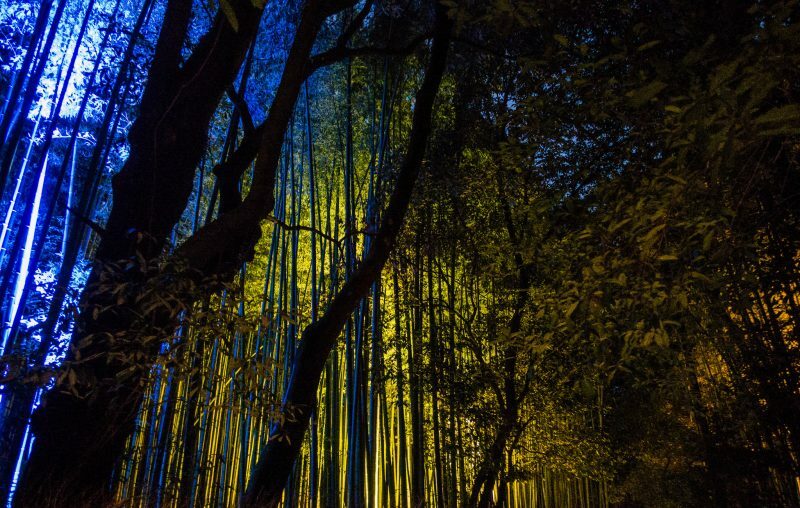 Between December 11th and 20th, one of the best night-time events called Arashiyama Hanatouro will be held in the Saga Arashiyama area. Thousands of lanterns are placed along the lanes of Arashiyama, including the walkway through the famed Arashiyama Bamboo Forest. Also, you’ll see many ikebana (flower arragement) installations scattered about as you walk the area. 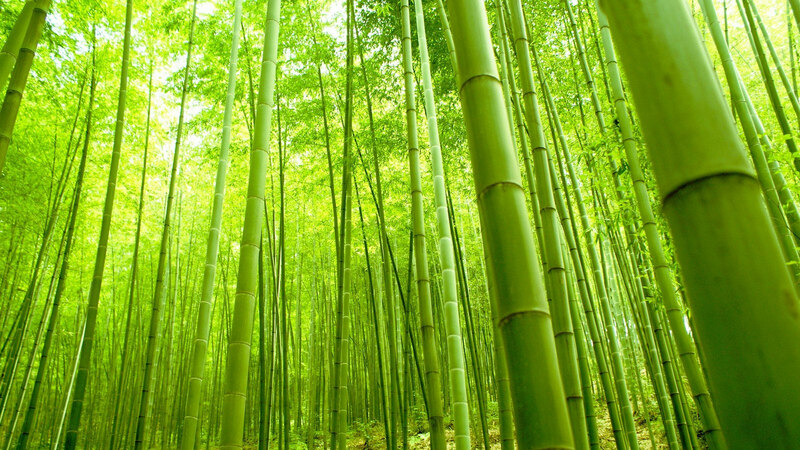 It’s an otherworldly sight and one of the best ways to see the famous bamboo forest. Christmas is another holiday gaining traction in Japan. While most locals are not Christian, they do celebrate the holiday in a secular way with Christmas shopping and a high-end dinner on Christmas Eve with a loved one. 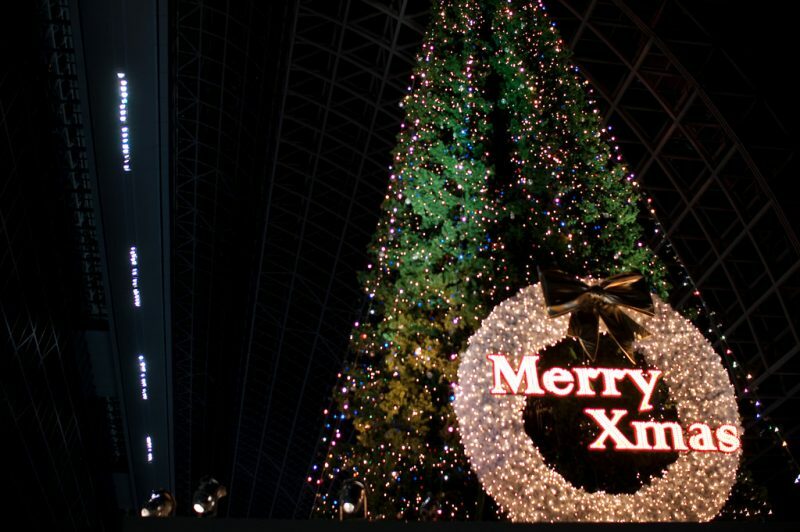 Head to Kyoto Station to see a giant illuminated Christmas tree. Or if you can take a trip to Osaka, go to Naniwabashi station and Mido-suji street to see the Osaka Festival of Light.